Artsploitation has delivered the ultimate stocking stuffer with the home video release of the Australian horror film RED CHRISTMAS. Veteran television director and actor Craig Anderson makes his feature debut with RED CHRISTMAS, combining the banal horror of family gatherings with the issues of abortion, feminism, ethics, religion and privacy, with a blood-splattered twist on what happens when secrets refuse to stay dead. Following a theatrical rollout across the United States, RED CHRISTMAS will be available across America 17th October 2017 on Blu-ray, DVD and Digital HD, including iTunes, Amazon Instant Video, Google Play, Vudu and more. Genre icon Dee Wallace (The Hills Have Eyes, The Howling, E.T., Cujo, Critters) stars in a critically acclaimed role as the stressed-out mother of a squabbling family, gathered together in a remote Outback estate on Christmas Eve. Their petty dramas threaten to blacken the holiday until a mysterious and deformed stranger appears at the door seeking bloody vengeance. 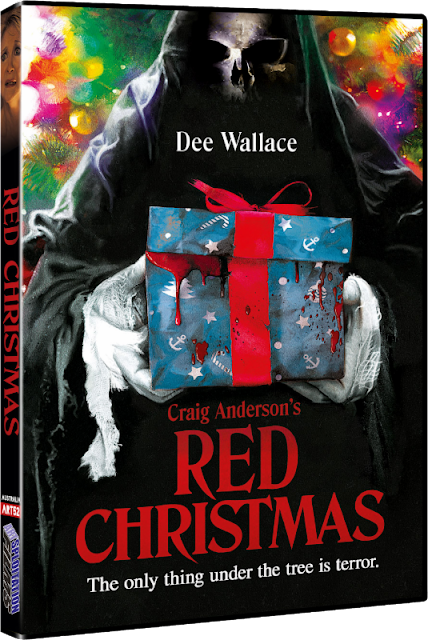 The Blu-ray (SRP $22.99) and DVD (SRP $17.99) releases of RED CHRISTMAS will exclusively include a feature-length commentary with writer-director Craig Anderson, interviews with Dee Wallace, Gerald Odwyer and Craig Anderson, bloopers and more. U.K. audiences should look out for RED CHRISTMAS coming to DVD from 101 Films around 13th November 2017. Below you can check out an exclusive clip and the trailer to the festive mayhem like no other. Red Christmas - Trailer from artsploitation on Vimeo.